B-fast Buns, T.G.I. Friday's Stats, Gluten-Free Finds & More! 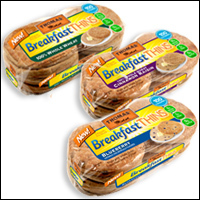 Thomas' Breakfast Thins - The slim-sandwich-roll craze is getting really specific -- these newbies are formulated for A.M. chewing! (But we wouldn't hesitate to eat them at other times of day.) They come in 100% Whole Wheat, 100% Whole Wheat Cinnamon Raisin, and Blueberry. Each roll has 100 calories, 1g fat, 170mg sodium, 22g carbs, 5g fiber, 2 - 4g sugars, and 4 - 5g protein (PointsPlus® value 3*). Sandwiches for breakfast = YAY! These are rolling out now, so be on the lookout! Perfect Foods Bar Lite, Cranberry Crunch - AMAZING-energy-bar alert! Here's the need-to-know info. 1) Cranberry Crunch is the only Lite flavor currently available; the others have WAY more calories. 2) Since the bars have no chemical preservatives, they need to be kept in the fridge. 3) They're gluten-free and PACKED with nutritious stuff like nut butter and dried fruit -- so not only do they taste great, but they're great for you too! Each bar has 199 calories, 10g fat, 24mg sodium, 19g carbs, 2.2g fiber, 13g sugars, and 10g protein (PointsPlus® value 5*). Look for them near the yogurt in the refrigerated section of the supermarket. The Republic of Tea Sip for the Cure Strawberry Hibiscus Tea - If you have trouble working up enthusiasm about tea ("YEEEE-HA! Who's ready to get their steep on!?! "), we're gonna make things a bit easier for you. This brand-new tea (arriving on shelves this week) straight up tastes like strawberries -- wonderful, tart, delicious strawberries. It's nice and sweet, great sipped hot, and amazing over ice. Plus, a portion of the proceeds benefits breast cancer research. And it has no calories or caffeine. Can we get a YEEEE-HA? Huge Menu News: T.G.I. Friday's Stats Hit the Web! Well, duh, potato skins aren't a smart choice, but did you think they'd be THIS bad? On the other hand, this flatbread is a lot lower in calories than we would have assumed -- split it with your dining companions! We were APPALLED to learn how high the stats are for these Japanese Hibachi and Mediterranean skewers, both the chicken and beef! 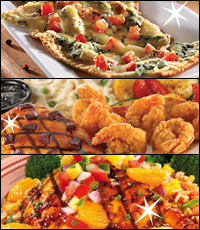 Luckily, the sweet 'n spicy Dragonfire Chicken, complete with loads of veggies and fruit, has your back. Click here to download the full nutritional guide. Which T.G.I. Friday's dish should we give an HG-friendly makeover? Let us know! These Beans Are Made for Crunching! Are Beans the New Snack Food? These Products Say So! It's no secret that beans are nutrient-packed all-stars. But, up until now, they haven't exactly fallen into the category of crispy snacks. So when we found these new goodies made from legumes, we just had to spill the... you know. BTW, all of these are gluten-free! Mediterranean Snacks Baked Lentil Chips - These delicately flavored crisps are tasty, light, and VERY crunchy. Plus, they come in a slew of flavors -- the HG HQ fave is Cucumber Dill! A serving (about 22 chips) has 110 - 120 calories and 3g fat (PointsPlus® value 3*). Click to find or buy online! 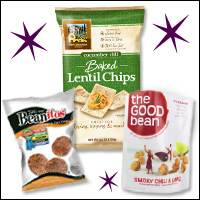 The Good Bean All Natural Roasted Chickpea Snacks - Kinda like CornNuts, only made from garbanzo beans! The flavor lineup features Smoky Chili & Lime, Cracked Pepper, Sweet Cinnamon, and Sea Salt; a 1/4-cup serving has 140 calories and 2g fat (PointsPlus® value 3*). They're a little odd but definitely tasty! In select stores and available online. Beanitos - Another lineup of BEAN-BASED chips -- these are like crunchy corn chips without the corn! All four flavors -- Pinto Bean & Flax, Pinto Bean & Flax Cheddar Cheese, Black Bean, and Black Bean Chipotle BBQ -- taste really good. And they come in single-serving bags; each 1.25-oz. bag has 175 - 187 calories and 8 - 10g fat (PointsPlus® value 4 - 5*). Click for locations or order some online. GOOD NEWS! After the tragic (at least for us) pumpkin shortage of the past couple of years, we're happy to report that pumpkin will be in good supply this year. 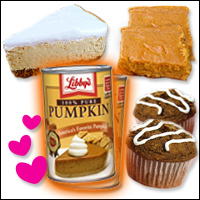 No more ordering cans in bulk online or fighting over the last can of Libby's in the supermarket. Whew! ***If the edible items in this email have you licking your lips, these food-flavored lip balms are for you! General Mills (parent company to brands like Betty Crocker and Pillsbury) has launched balms that taste like cereal, frosting, cookies, and more -- and they're all available online! Pucker up... ***How often do you eat a burger? If you're like 48 percent of Americans, the answer might be as often as once a week... or more! A recent survey shows that burger consumption in the U.S. is up by 10 percent since '09. We wonder if that includes veggie burgers... ***Look out, grown-ups! On September 13th, kids rule... the kitchen! Young Chefs International has announced the first annual "Kids Take Over the Kitchen" campaign. If you know a kid who'd like to get cooking, click here for more info on the national event! ***Here's something interesting: A four-month survey of social-media-savvy "tastemakers" found that 22 percent of these consumers perceive food from McDonald's as being "healthy" and "fresh." McD's scored higher than any of the other fast-food chains rated, including Subway. Really? Hmmm... That's all we've got. HG out! Orange You Glad Pumpkin's Back? News only stays new for so long -- click "Send to a Friend" to pass along this email ASAP!